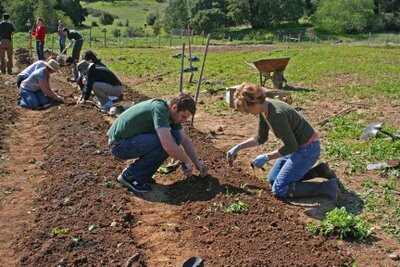 What began as a set of plans and a burgeoning partnership with the College of Marin and Conservation Corps North Bay is now a vibrant educational farm and garden on the Indian Valley Campus. More than 80 students participated in the first two offerings of the 15-week “Principles of Farming” college course. In addition to our instructional role, staff is connecting these students with employment opportunities on Marin farms and in community-based agricultural organizations. 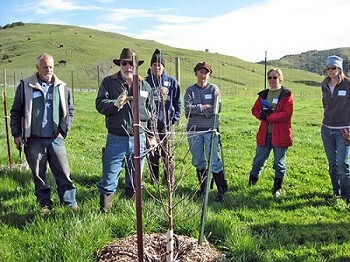 Responding to the increased interest and demand for information by individual homeowners, Grown in Marin education workshops were tailored to the needs of these “backyard farmers.” More than 140 participants learned how to prune and graft fruit trees, raise chickens, and many other skills related to their own food production. 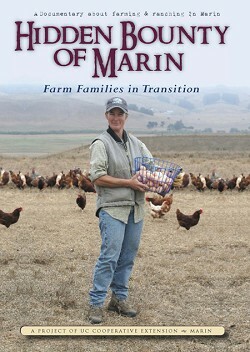 Hidden Bounty of Marin, our documentary film produced at Novato Public Access Television and featuring Marin’s farms and farm families, was an approved entry in the 2009 Mill Valley Film Festival. It also won the Alliance for Community Media 2009 Hometown Video Award for Documentary and the 2009 Best Documentary at the Marin County Festival of Short Film and Video. More significant is the use of this film by Marin’s school teachers. We have provided copies of the film to more than 475 teachers countywide and developed a discussion guide to support teachers using the film for education purposes.